Here Are 5 Things You Can Do To Make Sure Your Voting Experience Goes Smoothly Here are five things you can do to make sure you can cast your ballot as smoothly as possible on or before Election Day. A man registers to vote at the Early Vote Center in Minneapolis on Oct. 5. "The machines will be hacked!" Voters are getting an earful in this campaign. No wonder many are worried whether their ballots will be counted correctly. But if history is any guide, the overwhelming majority of voters will have absolutely no problems at the polls on Election Day. And election experts say many problems that do emerge can easily be fixed. If you plan to vote, here are five things experts say you can do in advance to help ensure a smooth experience. One of the biggest problems voters face is that they think they're registered but they're not. Or there's an error in their registration that they didn't know about. Maybe their name is spelled incorrectly, or their address is wrong. The best thing to do is check that you're registered and that the information is correct before you go vote. The registration deadline has passed in a number of states but there's still time in many others. If you find a mistake, you might be able to fix it in any case. Most states allow you to check your registration, and even register, online. This website from the U.S. Election Assistance Commission will link you to your state election website. Those sites will also help you locate where you're supposed to vote (maybe even how to get there) and what hours the polls open and close. Check the ballot ahead of time to see what races you'll be voting on. This should help lines move more quickly. You should be able to see a sample ballot online — if you haven't already received one in the mail — and information about what type of voting equipment you'll be using. Often, a state or county election office will post a video online showing how the voting machines work. Here's an example of one from Maryland, which recently replaced all of its touchscreen voting machines with paper ballots. There's a good chance your local election office also has a machine on display somewhere that you can try out ahead of time. Also, know the rules in your state. Do you need ID? If so, what kind? Does your state require that you cast your ballot in the right precinct for your vote to count? Some do and some don't. In most states, you can vote early, or by mail, if you don't want to vote on Election Day. If you vote by mail, make sure you follow the directions carefully. Many ballots are thrown out because voters don't sign their names, or provide all the correct information. You should also know the deadlines for sending in your ballot. When does it have to be received or postmarked? Election officials advise mailing ballots at least five days before the due date — which could be before or after Election Day, depending on your state. You can do this in most jurisdictions, believe it or not. Election officials have to test all the equipment in advance to make sure everything is ready to go, and it usually happens in the week or two before Election Day. "It's insanely boring, but insanely important," says Matt Masterson, a member of the Election Assistance Commission and a former Ohio election official. "Election officials I talk to absolutely lament the fact that rarely do people show up for the public testing of those systems." Some places will even stream the testing online so you can watch at home. The public can also watch the votes being counted on election night and post-election audits, in many states. Check with your local election office to find out what you can observe and when. Donald Trump has called on supporters to go "watch the polling booths" in "certain areas" to make sure there's no cheating. Supporters of Hillary Clinton fear this could lead to voter intimidation. But there's actually a well-established process for citizens to become poll watchers, and it requires training and certification. Usually, poll watchers are assigned by the political parties and campaigns to help ensure that the election is fair. 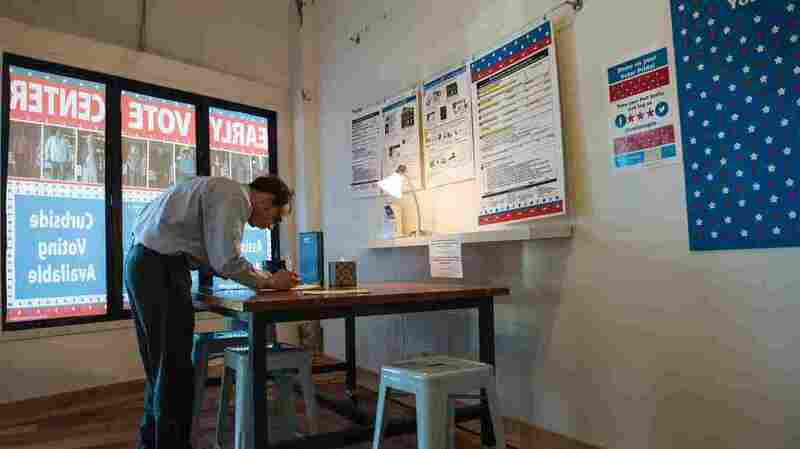 The rules differ from one place to another, but generally poll watchers can challenge voters who they think might not be eligible, or report possible irregularities to election officials. They are NOT supposed to interfere with voters or the voting process. Perhaps the best way to see what goes on at the polls is to volunteer to be a poll worker. Poll workers are the volunteers who set up the machines, greet you at the registration desk, help you get your ballot, collect it after you've voted and generally assist voters. There's still time to sign up and election officials are always looking for help on Election Day. "It's the best way to gain confidence in the process because you learn it inside and out," says Masterson. Becoming a poll worker usually requires going to a training class or two and a long work day Nov. 8. Most poll workers get a small hourly stipend, even though it's a volunteer job. Masterson has one other piece of advice: If you have questions, ask. He says most election officials welcome questions, because answering them now means fewer problems on Election Day.